So get on out there, wrecky minions, and enjoy your tubing tentacle babies! They, uh, may be a little stale. Thanks also to Hannah, Nick G., Kathy R., Leah and John, Emily K., Meg G., and Grace S., for being especially frindly. Happy New Year Jen and John ! (I HAD to use an exclamation mark, just for you guys). May your year be Healthy and Safe and thank you from the bottom of my wreckie heart for the year of laughs, tears (for when I laughed so hard I cried) and wet pants (for when I almost peed myself laughing). You make each day a LOT more fun each and every time I visit my favorite web site in the whole globe. Raise a glass to another year of wrecks and chuckles, gafaws, ughs, wtf's and all the rest. God Bless guys! May I seond Cookiemama in her salute? Thank you for helping me survive what turned out to be a very crazy year. I'd toast you, but the cork of the champagne bottle seems to be drawing sperm to it, much like cake no. 3. You know, I always thought that champagne and procreation were linked, but not quite so obviously. Happy New Year to you, the cakes and the kitties!!! Picture #4 is really on to something. I mean, long-stemmed shot glasses? Fabulous! You can advertise them with patented "NEV-R-STAND" technology! re: the last photo--Happy New Year to the Best of "Stick figure, Pi, Mu, Hieroglyph"? I just can't keep up with all the latest emoticons and texting language any more! #3 at least the champagne is from a good year. Second to the last - Mr. Bubble's babies ? Happy New Year to the Best of Frinds; John and Jin! Thanks, Cake Wrecks. Since I started reading here in earnest, I've become obsessed with the idea of inventing some gadget or magic spell which would make CCCs up to 75% less awful. * Don't worry. Once I make my billions on the patent, I'll make sure you get a generous glob of frost-- er, PROFITS! I meant PROFITS!-- for being my inspiration. Thank you for making me laugh every day. That goes for J&J as well as the brilliant commenters on this blog. I had a horrendous year and knowing I could get a good laugh here meant a lot to me. As she said, here's to Twenty Fifteend as we pop the, uh, cork for a toast! 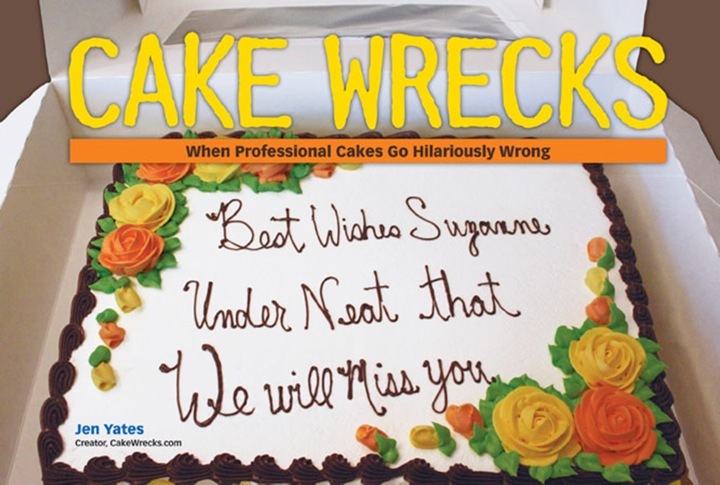 To another year of daily Cake Wrecks! Happy! New! Year! Jen! And! John! Thanks. for. all. of. the. laughs. and. for. being. the. best. blog. frinds. ever. The last green bottle of bubbly looks like it was supposed to be a Christmas tree. It didn't sell, so it got repurposed, maybe?? Jen and John, I raise my (long-stemmed shot) glass to you in thanks for a wrecktastic year! (and I don't just mean the cakes: my computer has been in serious danger from spontaneous coffee spewage in the last four years!) May there be many more laughs to come! #6 Awww; Coneheads are so cute when they're little. #7: Frinds don't let frinds decorate cakes drunk. *Special to John & Jen: Thanks for olive the hard (-to-look-at) work that you do*, to give us all belly-laughs (and belly aches)! Happy new sneer! *Not to be confused with Olive, the other reindeer...yukyuk. Does that first champagne bottle say "champagne from a good year"? *Not to be confused with Olive, the other reindeer...yuk yuk. First, thank you so very much for the gift of giggles throughout the year! And #3 might just be a green slug with explosive diarrhea. Yes, a very Happy New Year to the best of frunds! Jen and John (THOJ) and Sharyn and the wrecky crew for working hard so we have something to laugh at every day. And to the wrecky wregulars who make the comments section an awesome club to be in! I saw my first pan-wow on the weekend! Of course I pointed and proclaimed loudly - look! Pan-Wow! And nobody knew what I was talking about. But that's okay because I knew YOU ALL would! And I was not alone in the world. Keep warm, be safe (don't drink or text or put on your makeup or watch the DVD and drive) and wreck on! A wonderful New Year to Jen, John, the CakeWrecks staff and everyone here. Thank you for the many, many laughs! Happy New Year Jen, john(thoJ) and the CW Crew! Thanks for another year of laughter, and here's to many, many more! And, Happy New Year to all the Wreckies! See you in 2015! According to wreck #4, I understand that at 11:00 we are supposed to drink carbonated Scope out of candlesticks. What I don't understand is why. When the rubber hit the road, the Good Year champagne rolled over and got flat. Happy New Year, y'all. Hmm, I think those are baby Michelin Men. The Michelin Man's true name is 'Bibendum' from the Latin verb word meaning 'to drink'. Which is a weird name for a guy meant to be made of stacked tires, but this picture explains all. Born as Champagne foam, he grows up to be tires. Most of us get tired as we age, he just gets there sooner. Wikipedia has a nice article on Bidendun, though it fails to explore his infant form, instead giving some malarkey about a beer poster. This picture of infant Bidendums may be a first, spirited out of the nursery where they are first poured, and later vulcanized into tires. This unusual manufacturing process helps explain their high price. The skinny shot-glass flutes make me smile. They may be all wrong, but they have style. John's cartoon man would look good with one of those. Lol looks like the wreckerators started drinking hours ahead of time. Wow. I cannot stop laughing at the 2012 baby things lmao.